I’m sure you’ve all heard that Einstein quote about insanity. If you have played any of FromSoftware’s “Soulsborne” games, you’ve felt it. This is especially true with their newest Activision-published title, Sekiro: Shadows Die Twice. Stepping into Sekiro, I immediately found myself intrigued by the new world and narrative while still gripped with a sense of nostalgia. Unsurprisingly, that trademark FromSoftware aesthetic of darkness and mystery is left fully intact. However, don’t let that familiarity fool you. At its core, Sekiro is an altogether unique experience and should be approached as such, especially in terms of combat and traversal. The opening moments of the game find the protagonist, a rogue shinobi called Wolf, slumped over, languid and hopeless at the bottom of a well in a fantasy version of Sengoku-era Japan. In a moment that feels very much like a nod to the first Dark Souls, Wolf is motivated only by a mysterious voice and a letter telling him to make his way to the moon-view tower. 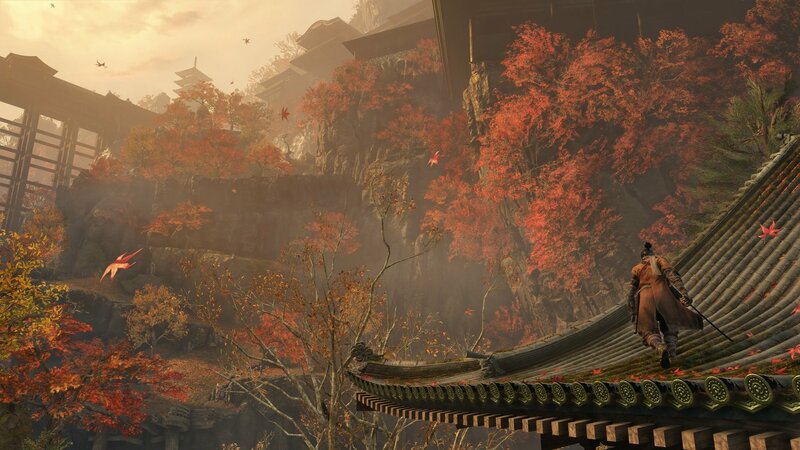 Unarmed, the player sets out into the world for the first time, and the game quickly introduces some of the mechanics that set Sekiro apart from its contemporaries — stealth, jumping, ledge climbing, and eavesdropping. For players new to FromSoftware games, these mechanics likely won’t come as a surprise, since they aren’t exactly unheard of in video games. However, they’re absolutely alien when it comes to past Soulsborne games, which see players trudging through the world focused more on direct combat. Despite being so new to the developer’s repertoire, the stealth and traversal feel great and mesh well with the game’s other systems. By having the player enter the world unarmed, players are taught from the get-go how to use and get comfortable with the new stealth system in a narrative-friendly and unobtrusive way. The opening area is designed to force the player to experiment with jumping and ledge climbing to progress, but not in a way that feels forced or out of place. The ability to eavesdrop on certain enemy soldiers also encourages players to approach situations stealthily by providing helpful information about the world. like where to find important items or how to access hard to reach areas. After a brief stealth sequence early in the game, we meet the young Lord Kuro and acquire our main weapon — the Kusabimaru. Quickly thereafter, players are introduced to Sekiro’s combat, which is where the game really shines. Naively, I thought that having a wealth of experience in FromSoftware’s past titles would give me a leg up in Sekiro. Hoo boy, I could not have been more wrong. While the combat is visually and fundamentally similar, it plays very differently from what I was used to. The change of pace from Bloodborne to Sekiro is almost akin to the change in pace from Dark Souls to Bloodborne. Dark Souls was much slower, and I often found myself playing defensively behind the safety of a shield. Bloodborne was essentially the opposite, focused on speed and hit-and-run tactics with virtually no blocking. Well-timed high-risk/reward parries and dodging were the primary means of defense. Still, I found myself playing like a scared baby and rarely tried to parry enemies, because failure was likely punished with massive damage or death, depending on the encounter. 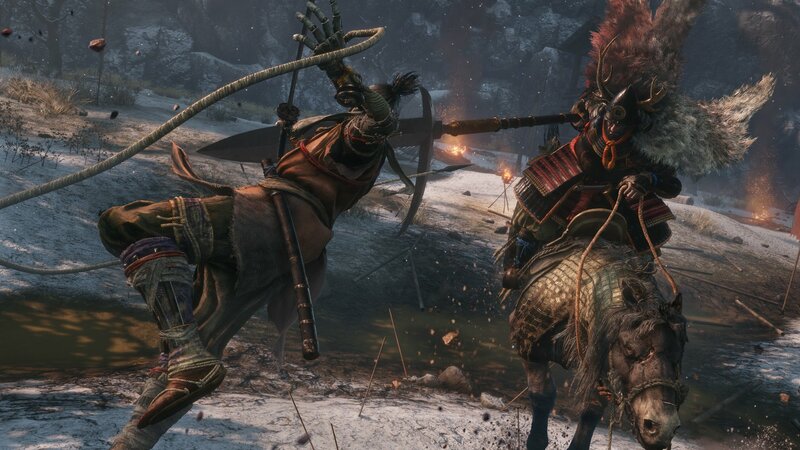 In Sekiro, it’s all about balancing offense and defense to break your opponent’s posture while maintaining your own. This is accomplished by pressuring enemies with your own attacks and deflecting theirs. After many hours of avoiding parrying in Bloodborne, my brain immediately said “No no, don’t deflect. Dodge around like a maniac and swing when you see an opening.” Enemies’ postures recover rather quickly depending on their vitality, so that strategy really backfires in most cases. By the time you back off to safety to heal or wait for the enemy to attack and leave themselves open, their posture will have recovered and you’ll be back where you started. After spending more time struggling on relatively simple encounters than I would like to admit, I finally took a step back and tried a different approach. I forced myself to be a little more aggressive, dodging toward and around enemies rather than away while making an effort to block and deflect. Deflecting is a bit less punishing than the parry systems I had gotten used to, but still requires proper timing to pull off. Playing as if I had to balance stamina usage was a hard habit to break as well. Once I got the hang of the basics, it was like my eyes were finally opened, and I was playing a brand new game all over again. Combat was suddenly an invigorating blend of quick, deliberate movements and attacks, instead of long, drawn-out battles of attrition that made even low-end enemies feel like tanks. I typically felt cunning and powerful even when I was getting obliterated by tougher enemies because I knew it was just a matter of time until was familiar enough with the encounter to overwhelm the enemy. This type of “learning by doing” was a recurring theme in my time with Sekiro. I always felt like I was growing and learning as I made my way through the world. Aside from limited tutorial messages in the opening hours, along with loading screens (which surprisingly offered extremely helpful information at times), Sekiro did not hold my hand at all, which only added to the feeling of accomplishment every time I overcame an obstacle. I came away from every encounter feeling like I had learned something important that I could carry with me into the next. For example, my first few attempts at one of the games harder bosses were an absolute nightmare. I could barely get through the first phase, let alone push to the third. I was getting pummelled to the point I wasn’t sure if I could keep going with the game. I decided to take a break and explore, eventually making my way to Gun Fort. I progressed to that area’s boss and got slaughtered there too. After a few attempts against such an insanely aggressive enemy (and a mental health break or two), I realized I had fallen back into old habits and wasn’t blocking/deflecting — I was trying to dodge everything. I changed tactics and forced myself to deflect his attacks, and managed to take him down that attempt (I’m pretty sure my neighbors could pinpoint the moment took him down). Needless to say, the feeling of defeating a boss after getting annihilated over and over is nothing short of incredible. FromSoftware has a knack for crafting encounters that leave players with an almost indescribable feeling of triumph after a victory. After my hard earned victory at Gun Fort, I felt like I had mastered deflection, and I knew I could eliminate our boy in Ashina Castle. I made my way back with renewed vigor, and sure enough, got slapped down almost immediately. This time was different though. I knew exactly what I had been doing wrong, and I knew what I needed to do to win. I kept at it and trounced him after a few more attempts. 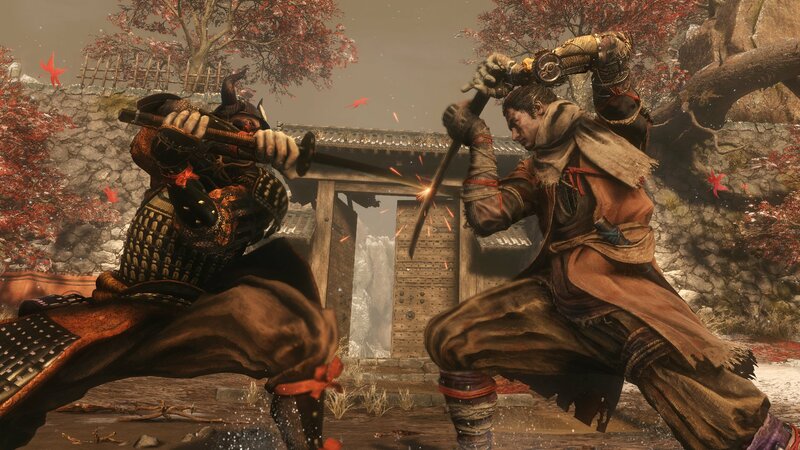 Sekiro’s systems are something special as well, and only add depth to the already impressive swordplay system. 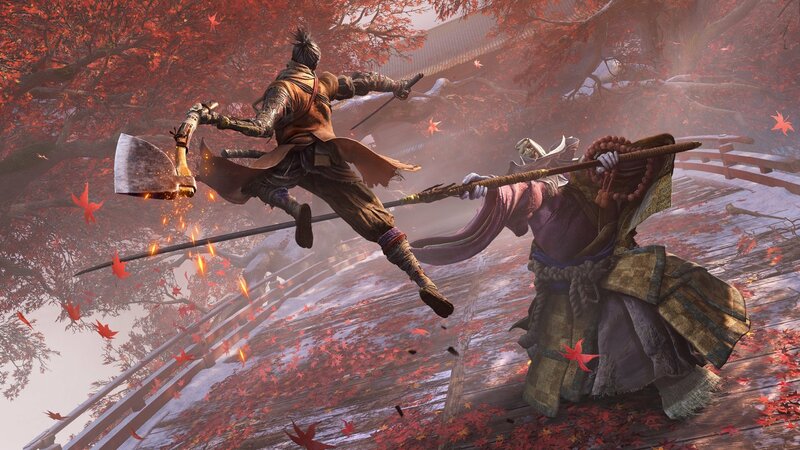 Rather than character progression being tied to stats, weapons, and armor that you find along the way, Sekiro has a skill point system that allows you to unlock new passive and active abilities from a handful of skill trees. Active abilities can be assigned on the fly, and switched up depending on the task at hand. While lacking the build variety you might see in games with myriad stats and armor sets, this allows for much more flexibility in terms of adjusting one’s play style or abilities on the fly, instead of adapting to and sticking with one build for an entire playthrough. Skill trees — when combined with shinobi tools, which have upgrade paths of their own — make for satisfying and intuitive customization, without introducing any complication from stats, or worrying about optimal weapon and armor configurations. This system rewards strategy and awareness, as well as the ability to effectively use the tools and abilities at your disposal. Vitality and posture are both upgraded using the same item, with one other item to increase attack power. There is never the need to choose between stats like health, stamina, equip load, or your primary damage stat. Sekiro is a beautifully realized game that is brutally difficult in the best ways. Visually, it’s breathtaking, and the narrative — in true FromSoftware fashion — is subtle, full of mystery, and presented much more clearly than their other recent titles. Even without build variety, new weapons, and armor to hunt for, Sekiro: Shadows Die Twice is a game I think I will find myself coming back to for quite a while. This review is based on the PlayStation 4 version of the game. A copy was provided by Activision.